"I have a128GB SD card which has one partition only, and now I want to partition it to 2 partitions so as to increase internal memory of my Android phone. However, the Disk Management of Windows doesn't allow me to create an unallocated space for new partition since Shrink Volume feature is grayed out. What should I do"
"I want to format my SD card from NTFS to FAT32 so that it could be used between Mac and Windows. However, though Windows format utility is capable of doing this, all data will be erased"
"I was unable to delete partition of SD card, because the Delete Volume option is grayed out. What's happening? How can I delete it to create a new one"
Well, how can Windows users partition an SD card like a magician? MiniTool Partition Wizard could help them achieve this goal. Create Partition: it could help you create FAT32, NTFS, Ext2/3/4, and even Linux Swap partition, and the version that will be released supports creating exFAT partition. On the contrary, you are unable to create FAT32 partition larger than 32GB in Disk Management. In addition, you can create Ext partition on SD card to increase internal memory of Android mobile phone. For more details, please see 7 Methods to Increase Internal Storage Space of Android. Delete Partition: as we know, Windows Disk Management doesn't allow users to delete partition(s) on removable devices, but Partition Wizard can help you delete such a kind of partition easily. Format Partition: it could format a partition on SD card to FAT32, NTFS, Ext2/3/4, and Linux Swap. You can even format a partition larger than 32GB to FAT32 if you use MiniTool Partition Wizard. Move/Resize Partition: it could help shrink a partition to create unallocated where new partitions could be created. Convert FAT to NTFS or Convert NTFS to FAT: it could help you change file system between NTFS and FAT32 without losing data. 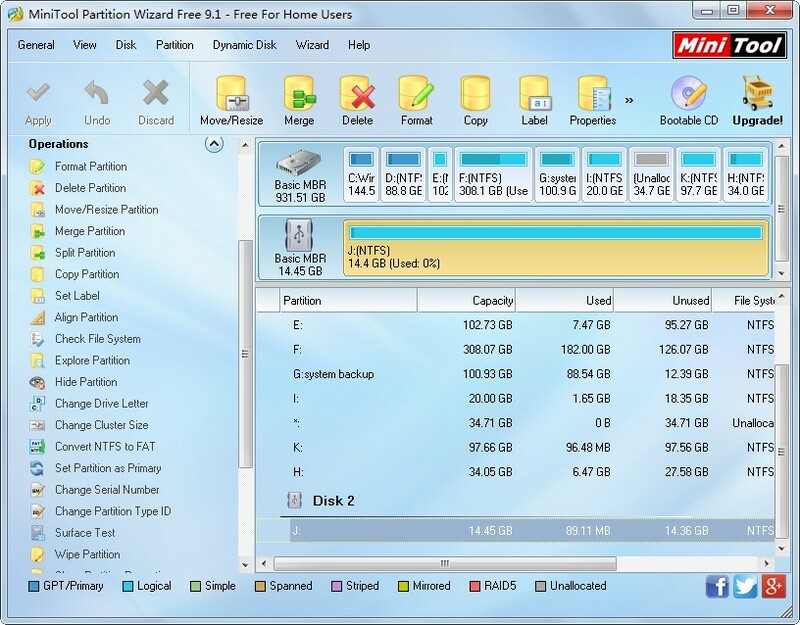 Therefore, when you need to partition your SD card in Windows systems, MiniTool Partition Wizard is worth trying. It is free for all Windows non-server users, and no professional knowledge is required.